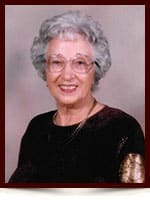 Betty Rhodes - Edmonton's Burial & Cremation Professionals | Trinity Funeral Home Ltd.
On March 24, 2016 Betty Rhodes passed away at the age of 94 years. Betty will be lovingly remembered by her two children; son Clifford (Carol) Rhodes of Victoria BC and daughter Linda Rhodes of Edmonton AB, five grandchildren and three great grandchildren, as well as several nieces, nephews and extended family in Wales. Betty was predeceased by her loving husband Bob Rhodes and brother Ronald Game. Betty will be dearly missed by all who knew her. The family would like to thank the staff at the Rosedale Villa for their care and kindness. In lieu of flowers the family ask that make a donation in Betty’s honor to the charity of your choice. Cleaning up my desk at work, picked up my note to self: “Betty Rhodes”, and ended up here. I last spoke to Betty when she called to say that she was moving out of her house, and had found a good home for her trusty 240 Volvo. Mark and I were supposed to go visit her in her new place, and it is our loss that we did not make that happen. Betty was a topnotch customer to deal with, a lovely lady, and an absolute treat to know. I know that as a family you have the blessing of many treasured memories. Linda, my deepest condolences to you and your family. Remembering you all today. We were both saddened by the death of Betty. Although lost contact over the years her name brought back pleasant memories of earlier meetings. Please accept our sincerest condolences. Clifford, Linda and your families; We are sorry to hear that Betty has passed away. She was Mum’s best friend, and I know Mum will miss wondering what Betty is doing in Edmonton. We all loved Betty as she was so much fun to be around. Thinking of you both and knowing you will miss her. Linda, I am so sorry to hear of your mom’s passing. She was a beautiful lady, in fact she personified the word ‘lady’. She put up with a lot of our shenanigans when we were younger! She got me my first job with the government. Ken remembers her from Publuc Works. My mom died at Christmas time in 2014, so I know what you are feeling. My condolences to you, your brother and your families.. If you knew Betty Like I did you would have great laughs. She was competitive and loved playing crib and almost any card game.She always told me how blessed she was to have a daughter like Linda, She had a very competitive spirit and always found the humor in everything. I will miss her dearly and offer my sincere condolences to all her family especially Linda. We would like to send our love and condolences in memory of Betty, although we are the other side of the pond, in England, Mum (Rosemary Bowers nee Game) Ann and I remember visits to Canada and Betty & Bobs visits back to the UK, such happy memories. You are all in our thoughts & today, on the 16th April and in the future. We are saddened to say farewell to such a charming and lovely lady. Her positive attitude, easy going smile and mischievious, quick witted sense of humour will be missed. Our condolences to her family. Please accept my condolences on the loss of your mother, grandmother and friend. Her presence will be sadly missed and that lovely smile never forgotten. We are so sad to hear of the passing of our dear friend, Betty. Please accept our sincere condolences. We are sending warm thoughts to all of you during this difficult time.